This was a surprisingly satisfying dinner. I had no idea what to expect from the jicama risotto, but it was good – the jicama had a really mild taste (mostly tasted like the broth I used), and served as a nice “starchy” base for my veggies, fat and decadent seafood. First, prep your jicama. Peel [I used a knife because my peeler wasn’t cutting it (ha)], and cut into large pieces. Feed through the shredder disk of your food processor. If you want smaller “rice” bits, pulse a couple times with the cutting blade. In a large pan (I used my wok), heat the broth over medium-high. Add the jicama and cook, stirring frequently, 10 minutes or so – until the broth evaporates. Hit with salt & white pepper a couple times during cooking to season. While the “risotto” is working, brown the bacon and set aside. While the bacon is working, chop the broccolini and thinly slice the shallot. When the bacon is done and you have removed it from the pan, halve the fat leftover, kick the heat to medium-high, add the broccolini, and sauté 5 – 6 minutes, or until the broccolini starts to look a bit softened. Add the shallot, hit with salt & pepper, and sauté, stirring frequently, until the broccolini is softened and the shallots start to brown (about 10 minutes). When the broccolini is finished, remove and add the rest of the fat to the pan. Salt & pepper the scallops and cook over medium-high until just firm, flipping once during cooking to get a nice sear on both sides. Scallops take 3 – 5 minutes to cook through. 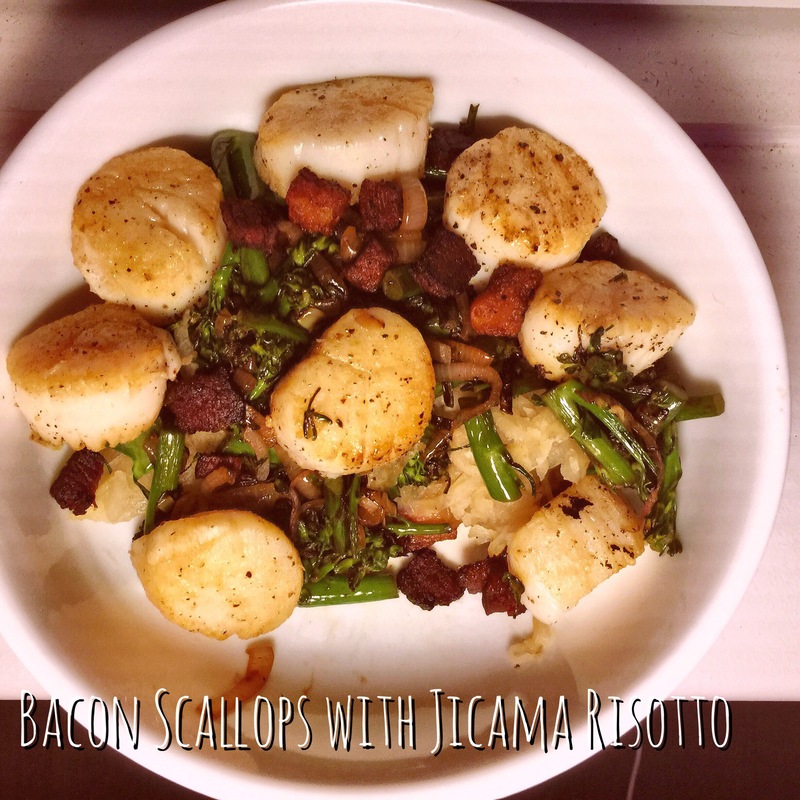 To serve, top the risotto with the broccolini and scallops and top with crumbled bacon.